There’s no denying it: influencer marketing is getting more and more popular with businesses. 94 percent of marketers consider it an effective social media marketing method that creates authentic content for their brand. Influencer marketing is when brands use influencers — people who have a big following on social media, Instagram especially — to endorse their product and brand. This works for many reasons. For one, it builds brand loyalty. If Instagram users see that an influencer they’re into sponsors a product, they’re more likely to be interested in it and trust its quality because someone they look up to endorses it. Influencer marketing also increases your return on investment (ROI). A poll by Tomoson found that businesses make $6.50 for every dollar they spend on influencer marketing. A lot of influencers are most active on Instagram. A survey by Linqia found that 92 percent of marketers view Instagram as the most important social platform for influencer marketing, so it’s essential to understand its algorithm. Your entire influencer search will go to waste if you’re not sure who you’re looking for to endorse your brand. But it doesn’t have to be difficult for you if you think your plan through. Who does it cater to the most? What is the age range you’re targeting? Do you want an influencer from around the world or the country you’re in? How many followers would you prefer they have? How much engagement are you expecting or looking for? The more you narrow down who you’re targeting — also called a buyer persona — the more you’re able to find the right people to work with. Using the right tools to find influencers can save you a ton of time. 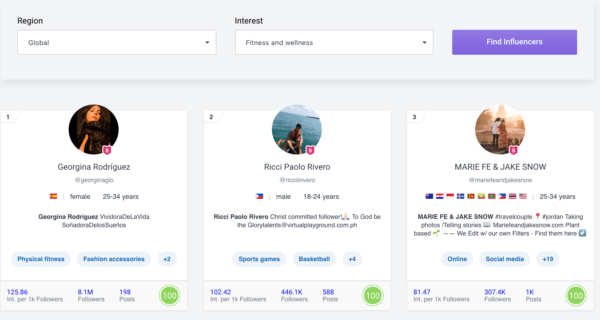 Social Bakers Suite has an influencer search tool you can use to find and collect information about influencers that will best suit your business. With this tool, simply select which region of the world you’re targeting and which category you’re looking for. Let’s say you’re a business specializing in fitness and healthy living. You’d select ‘fitness and wellness’ and go to the next page where you’ll find thousands of influencers in that category to choose from. You can see how many followers they have, how interactive they are with their audience, and other categories they fall under. Another great tool you can use to find influencers is Buzzstream Discovery. It lets you search based on the number of Twitter followers, domain authority, location, and more. Once you’ve found your perfect list of influencers, next is the tough part: contacting them. Let’s go through a couple of different ways to do this. 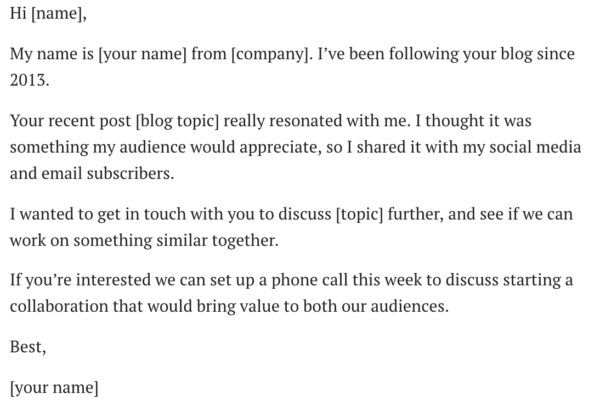 Direct messages, or DMs, are a more instant way of connecting with influencers because you’re messaging them directly through Instagram. It’s more informal and quick, so keep this in mind if you’re going the DM route. But before you DM, see if you were already following this person. A way to warm up to them is by liking and commenting on their posts. This way, when you do DM them, it’s possible they’ve seen your commentary and would be more willing to endorse you. Since it is informal, you want your message to be quick and to the point. It doesn’t have to be as formal as an email would be, but still be sure to speak professionally and clearly state why you want to work with this person. Of course, if they have thousands upon thousands of followers, a direct message might get lost in the fold. This is where email comes in handy. It can be daunting to think about emailing your favorite influencers to endorse your brand, but all of this is in your head. It’s just an email, no big deal. When sending out emails, it’s important to keep it straight to the point. You don’t want to send paragraph after paragraph explaining who you are or your company history. No one wants to read that. Instead, keep it short and simple. Tell them who you are, make it known that you’re an avid follower of theirs, explain why you think they’d be a good fit as an influencer for your brand and why they’d love your product. Most professional influencer Instagram accounts have business emails in their bios. If not, use Anymail Finder or FindEmails to search for them. Notice that it’s to the point, concise, tells the recipient exactly what they want, and then it ends. If you’re looking to get your brand name out there, influencer marketing is the way to go. It’s already proven to improve ROI and showcase authenticity, and these are just a few of the many benefits. By doing your research, you too could have an influencer marketing strategy that will boost your business through the roof.